Wireless capabilities are a huge trend nowadays. Whether you’re a gamer or just someone who works on a computer daily, finding the best wireless mouse can make your computing life easier and less cluttered. With this guide, we’ll help you find a functional and reliable mouse that will save time, money and space. Wireless mice connect to other devices via Radio Frequency (RF) or Bluetooth. RF connects with a dongle that plugs into a USB port. Bluetooth, on the other hand, connects to the mouse via a receiver that’s already built into the computer (you may need to buy a Bluetooth adapter if it’s not the case). There are a number of differences between the two. Some people prefer one or the other and there are compelling reasons for both sides. RF mice are very simple to set up. Simply plug it in and go (a pro). RF mice are normally more responsive to hand movements (a pro). RF mice can sometimes get interference due to high levels of frequencies throughout your home or workplace (a con). Bluetooth mice do not take up a USB port (a pro). Bluetooth mice do not have a dongle, so there’s no need to worry about losing or replacing this small piece (a pro). Bluetooth mice are more difficult to set up and require a few extra steps (a con). Bluetooth mice are preferred for people using tablets or laptops with minimal ports on them. For that reason, they are gaining more popularity, especially with wireless keyboard and mouse combos. However, RF mice also remain a popular and reliable wireless choice. Mice come in a wide range of shapes designed for different purposes, such as grip comfort. Many are made specifically for people who put in long hours on the computer and need maximum battery life, portability or silence. Some are also designed to accommodate left-handed people (or are ambidextrous). Ambidextrous mice can be used by anyone, making them a popular choice in workplaces and schools where left-handed or right-handed people may be using the same mouse at different times. Ergonomic mice come in many different shapes and are built for comfort. Some come with a thumb rest to help you avoid gripping the mouse too hard or dragging your thumb across the mouse pad. Others might come in a slightly curved or contoured shape that matches the natural movements of your hand. In addition to the shape of the mouse, the design of the mouse can also play a role in the comfort of your grip. There are three main grip types (palm, tip and claw) that are popular (primarily among gamers). Finding a good gaming mouse that’s compatible with your grip type means you can play more comfortably and avoid developing a strain in your wrist or fingers during long gaming marathons. Mice can have various buttons, with the basics being the familiar left and right mouse buttons. Almost all modern mice also come with a scroll wheel, which is classified as a button as well. Many of the best wireless mice have additional buttons and allow programming them. The most common additional buttons are a forward and back button located where the thumb rests. On most mice, the forward and back buttons can be reprogrammed to perform different tasks depending on your preferences. On some gaming mice, you may see up to 12 buttons on the thumb rest; all of these buttons can be used for different skills and talents. Of course, you may not want or need any of these extra buttons. If you’re on a budget and not too worried about additional features, there are many simpler options that can still get the job done for basic tasks. 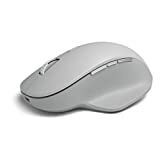 Wireless mice require batteries, but the type of batteries and their overall lifespan will depend on the intensity and frequency of the day-to-day usage of the mouse. Most of the wireless mice on our list come with a very long lifespan. Depending on how much they’re used, some don’t even need new batteries for over a year. If you’re a gamer looking for a wireless mouse, batteries become more of a concern. Due to their extended functionality (for example RGB lighting), wireless gaming mice tend to have their batteries used up much more quickly. A good wireless gaming mouse should be able to withstand even the longest gaming sessions without recharging. Some come with a quick-charge cable that you can conveniently plug-in if the battery is getting low. This means you don’t have to worry about losing a match because your mouse suddenly dies in the heat of a battle! Lithium batteries can be recharged and must be plugged in via a USB cable (both a pro and con). Lithium batteries drain faster and do not last as long as alkaline batteries (a con). Lithium batteries can rarely be replaced (a con). Alkaline batteries can last up to 4 years in a mouse with energy saving capabilities built in by manufacturers (a pro). Mice requiring alkaline batteries are normally cheaper than their lithium battery mouse counterparts (a pro). Alkaline batteries make the mouse much heavier (a con). While you should consider these differences, battery type generally won’t have a large impact on the overall quality of the mouse. Fast response is one of the features that make Logitech G903 LIGHTSPEED one of the best wireless mice on today’s market. It comes with 1ms report rate and a top-notch PMW3366 optical sensor. The latter one guarantees not only high speed but also zero smoothing, filtering and acceleration across the entire DPI range (200-12,000DPI). This mouse also provides continual optimized wireless connectivity. Note that it’s a unique item as it allows charging both during rest and work with maximum acceleration of 40G3. To get access to this wireless charging technology you will have to buy the Powerplay mouse pad. Its battery life with lighting on reaches up to 24 hours and if you turn the lighting off then you can get up to 32 hours. Logitech G903 LIGHTSPEED has an ambidextrous design what makes it suitable for both right- and left-handed users. Its configurable button layout allows you to customize it in a way you like or need it. This mouse is also ultra-light as it weighs only 110g. G903 is one of the best options for gamers. It offers not only fast and responsive performance, but also adjustable design due to Logitech Gaming Software. Thanks to it, users can customize RGB lighting from up to 16.8 million colors. They can also turn on LIGHTSYNC lighting effects driven by in-game actions. Another great wireless mouse from Logitech is MX Master 2S. If Logitech G903 requires a mouse pad to show its best performance, this one can be used on almost any surface. It has an excellent tracking feature due to a top-notch 4000-DPi precision sensor that can cope even with glass. What really makes this wireless mouse stand out from the other models is its ergonomic design which is aimed at supporting your hand during all ups and downs of your working or gaming process. Its special form provides natural position and as a result, prevents users from wrist and hand strains. Logitech MX Master 2S comes with dual connectivity provided by unifying receiver, so you can use it with up to three Windows or Mac PCs. Instead of the receiver, you can also use Bluetooth Smart wireless technology. So, what’s the point of dual connectivity? It allows users to transfer files between computers easily and fast. With MX Master 2S there is no need to use a USB flash drive or send messages with attachments in order to transfer a text or an image. Note that all data material which is transferred is also secured due to AES-256 bit encryption. Got tired of noisy clicks and scrolling? Logitech M330 Silent Plus can become the solution to this problem. Its quiet performance will let you enjoy gaming as well as plunge into the working process without any sound distractions. In fact, it’s the first wireless mouse that received the Quiet Mark certification from the UK Noise Abatement Society. Thus, its special technology which reduces noise is recognized at the international level. As well as the previous Logitech model this one has an ergonomic shape. M330 is designed with contoured grips made of soft rubber for comfortable use. Still, it’s suitable only for right-handed users what can be considered as a drawback. Logitech M330 Silent Plus has a great long-lasting battery life which reaches up to 2 years. There is an automatic sleep mode which helps to save energy and use it more efficiently. Its wireless connection works within 33ft and is provided by a plug-and-forget nano receiver. Thanks to the advanced optical tracking M330 has precise moves which guarantee accurate performance. This wireless mouse supports computers with different operating systems including Windows, Mac, Chrome and Linux. This elegant wireless mouse attracts customers at first sight thanks to its unique ultra-slim design. Microsoft Arc Mouse is one of the thinnest and lightest mice on our list. Such a small size makes it a compact item which can be easily hidden not only in your bag but also in one of your jacket pockets. This Microsoft wireless mouse looks stylish but at the same time has a good snap. There is also a great option of automatic shut off in case you snap the mouse flat and automatic connection when it is snapped up. Microsoft Arc Mouse provides both vertical and horizontal scrolling for easy and convenient navigation. It also comes with optimized left and right clicks as well as accurate sensor tracking. Note that it supports Bluetooth connection, so there isn’t any receiver you need to plug into your computer (unless you don’t have Bluetooth on your PC). Besides, this mouse doesn’t need any mouse pad for its work. There are also three programmable buttons on its front which let users set them for what they need. 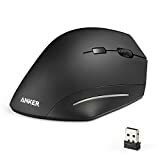 Still, this wireless mouse isn’t the best option for users who spend most of their time in front of the computer working or playing games. Despite its stylish look Microsoft Arc Mouse can’t boast of the best ergonomic design, so if you need something really comfortable then have a look at the other models mentioned on our list. Another great Logitech model to consider is MX Anywhere 2S. It is designed with cross-computer control gained through dual connectivity which allows using up to three computers simultaneously. This wireless mouse supports PCs with Mac and Windows OS. As well as MX Master 2S this model provides wireless connectivity thanks to unifying receiver. You can also use Bluetooth Smart connection. Note that MX Anywhere 2S uses AES-256 bit encryption to keep your information always private and secure. This wireless mouse also allows you to customize its functions. To do this you need to use Logitech Options software and setup Logitech Flow. After that, the mouse will be able to find and configure your PC in seconds. Logitech MX Anywhere 2S is an excellent option for those who often change their working place and need to be ready for different conditions. Thanks to 4000-dpi Darkfield sensor this mouse provides high-grade tracking on different surfaces. Besides, its battery life reaches up to 70 days after a full charge. In case you need a fast charge for your mouse then 3 minutes will be enough for the whole day. 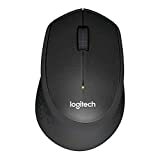 In case you are looking for something inexpensive but at the same time with decent performance, Logitech M585 is one of the first wireless mice to check out. 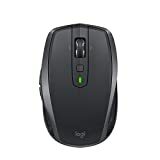 As well as the other Logitech models this mouse comes with dual connectivity which provides cross-computer control. Thanks to this you can use M585 with up to three computers which support Windows or Mac OS. Besides, it allows sending files from one device to the other one due to Logitech Flow option. 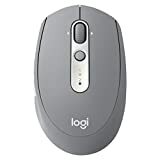 Except for the well-known Logitech features mentioned above this wireless mouse has a long battery lifespan which, unlike in all the other previous Logitech models, depends not on the charge but on a single AA battery. So, one of such batteries presupposes 2 years of work for this wireless mouse. What is more, there is a power-saving auto sleep mode as well as an indicator light to let you know when it’s time to change the battery in your mouse. Logitech M585 is designed with a domed shape to provide your hand with comfort. There are also two thumb buttons which can be used to go back and forward on the web or can be customized for a different purpose. Anker has also got something special to offer customers looking for the best wireless mouse. Its Ergonomic Wireless Mouse has an excellent design which makes it comfortable even for all-day use. Its countered shape will fit your palm and will provide smooth moves. Thanks to such ergonomic design you won’t suffer from wrist or hand strains. This mouse is simple in use. All you need to start using it is to plug the included USB receiver into one for your computer ports – and voila, you can enjoy its highly responsive performance. Anker mouse switches between DPI levels 800, 1200 and 1600 fast and easily what guarantees top-notch responsiveness. Optical Tracking Technology provides this mouse with high sensitivity and accurate tracking on almost all types of the surface. Note that it also supports all popular operating systems including Windows (XP/Vista/7/8/10), Linux and Mac OS X. By the by, Anker mouse is designed with additional buttons for page scrolling, which are conveniently placed on the thumb rest zone. Due to its sleek matte finish, you won’t face such an unpleasant thing as smudges or fingerprints as well. HP x3000 is another great wireless mouse to have a look at. It has an elegant and sleek design which will make your working place look stylish. This mouse works with a nano receiver which can be stored inside the mouse. Except for the ultra-slim and modern design HP x3000 has rubber side grips and countered shape to make the use more comfortable. Besides, its compact size makes it one of the best wireless mice for traveling. Its optical sensor works on different surfaces. There is also a great scroll wheel with fast performance. HP x3000 comes with AA battery which provides one-year lifespan. Keep in mind that this mouse supports only Windows OS (XP/Vista/7/8/10). Need something really cheap? Microsoft Wireless Mobile Mouse 1850 is at your service. 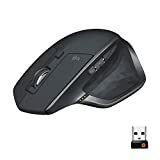 This wireless mouse is very compact and can be certainly called one of the best portable wireless mice for less than $15. Besides, it comes in 7 colors, so you may choose the one you like most of all. Despite its low price, this wireless mouse has a comfortable design and up to 6 months of battery life. What is more, it is suitable both for left- and right-handed users. This Microsoft wireless mouse works with a nano transceiver which you need to plug into your PC. When not used it can be hidden in a built-in storage in the mouse what is really great as you will always remember where you have put it. Apple Magic Mouse 2 will attract all customers who love stylish items or prefer Apple products. This wireless mouse comes with white polycarbonate arched design. It is also light and compact. There is an optimized foot design for easy and smooth sensor tracking which is less resistant across the desk than some other models. Its optical sensor has a fast reaction to movements and lets you adjust the sensitivity and tracking in the Mouse system preferences on the Mac device. Thanks to its ambidextrous design it can be used by all customers, both left- and right-handed. Note that Apple Magic Mouse 2 has Multi-Touch surface which allows you to look through web pages or scroll through the documents. It is also completely rechargeable, so you won’t need to buy any batteries. Magic Mouse 2 has a fast charge and two minutes of charge can provide you with 9-hour performance. A full charge is enough only for one month. By the way, this mouse doesn’t come with a receiver as it automatically pairs with Macs via Bluetooth connection. If you are looking for a highly adjustable mouse then don’t miss the chance to get one of the best items. Logitech offers a top-notch wireless mouse with a unique ergonomic design. Thanks to its adjustable hinge you can customize the trackball angle from 0° to 20°. This will let you find the most natural hand position to feel comfortable during the working day or when playing games. As a result, you won’t suffer from wrist strains. Dual connectivity provides this Logitech wireless mouse with cross-computer control and allows you to navigate on two PCs at the same time. 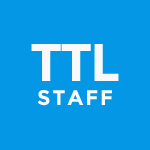 Due to its Logitech Flow you can also transfer files from one computer to the other one just in seconds. By the by, in case you do not need to transfer files you can switch between two devices just with a touch of a button. Note that you can connect the mouse to both computers via Bluetooth Smart technology or using a USB receiver. Logitech MX Ergo has a rechargeable battery with a 4-month lifespan on a full charge. By the way, the trackball angle isn’t the only thing that you can customize. The tracking button is another part of the mouse that can be adjusted. You can also customize your cursor speed with Logitech Options Software. Another example of a great wireless mouse is Microsoft Surface Precision. This mouse can boast of accurate performance and ergonomic design. It comes with a curved shape, side grips and a thumb rest. Together these ergonomic details make this mouse comfortable even for the longest working days. Microsoft Surface Precision is also a customizable mouse as it has three programmable buttons. It can work with up to three devices simultaneously and doesn’t take much time or effort to change the device. The mouse is equipped with a rechargeable battery which can last up to three months. This Microsoft wireless mouse supports only Windows OS. Even if you already have a good wireless keyboard, your setup won’t be complete without a reliable wireless mouse. If you’re looking to clear up your desk space and enjoy the convenience of using a wireless mouse, there are plenty of choices available no matter what type of PC user you may be. If you’re a gamer, look for wireless mice that feature customizable buttons, adjustable DPI and battery-saving capabilities. If you’d just like something simple and convenient, consider a wireless mouse with decent battery life (at least six months), a comfortable design and color options to match your preference. Ultimately, all you need to do is choose a wireless mouse suitable to your taste and lifestyle.